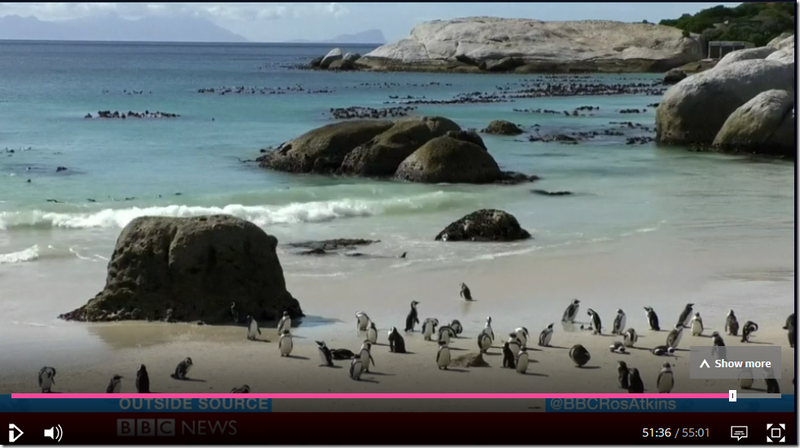 You may recall the BBC’s news story a couple of months ago, claiming that African penguin populations were declining because of climate change. I covered the report here. The report from South Africa, which then followed, made no mention of climate change at all, but instead laid the blame fairly and squarely on overfishing. Thank you for getting back in touch with us and for your further feedback regarding the BBC News Channel programme ‘Outside Source’. We have discussed your concerns with the programme team. There are a number of factors influencing the decline of these penguins but researchers are clear that climate change is one of them. Climate change has affected fish stocks, and increased severe weather incidences have depleted penguin chick numbers. *(The BBC is not responsible for the content of external websites). 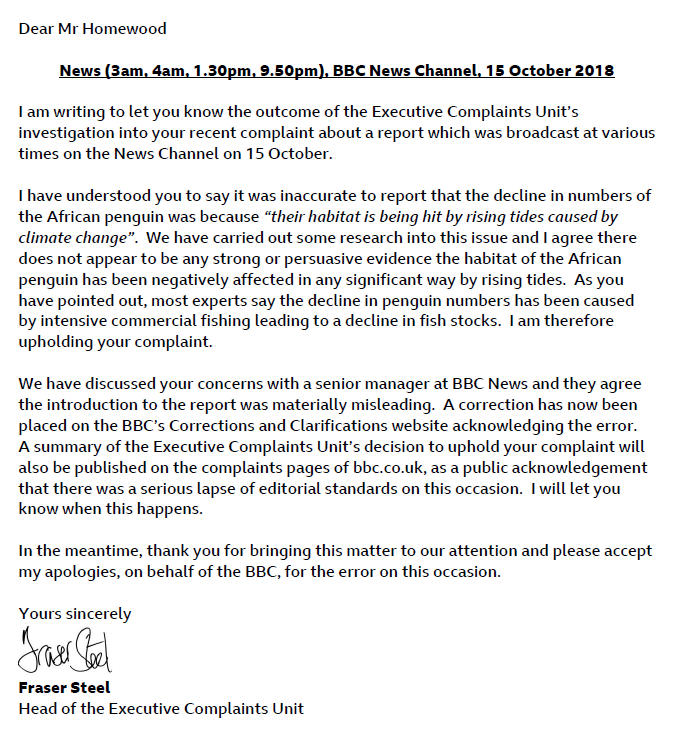 This is standard procedure at the BBC – send a reply that fails to answer the complaint, and hope that the complainer will get bored and give up. But they ought to know me better by now! This is not an isolated instance of false claims being made about climate change by the BBC. They now seem to be making a habit of it. But what makes this instance particularly remarkable is that somebody, whether the presenter or his production team, simply invented this claim out of thin air. After all, they should have known that the report from South Africa made no mention of rising tides or climate change at all. It is almost as if all BBC news personnel are under orders to hype climate change, whether the facts justify it or not. ← Climate Of Confusion: NASA, PIK Scientist Confirm Global Temperature Has Fallen 0.2°C Since 1850!